Who are Brittany Ferries Chartering the E-Flexers from? Stena RoRo, I presume. I don't think Stena RoRo chartering three E-Flexers to Brittany Ferries would, in any way, stop Stena Line from launching competing services against Brittany Ferries. If Stena Line see an opportunity for expansion, into a profitable market, they will take it. It's just good business. Why is the Isle Of Man covered here. I'm more concerned by this. Are foreign fishing vessels in our waters? If the british don't want anyone in theirs, they shouldn't be fishing other countries waters. Yes but there doesn't seem to be as many tidal variations to her schedule as Condor Liberation services. Take February 2018 for example, only four Commodore Clipper 0900 Sailings from Portsmouth to the Channel Islands do not go to Guernsey first, arriving between 1600 and 1610. The four that don't go to Jersey first, arriving at 2105. That is a fairly predictable schedule, and much easier for the customer to book. I have a genuine question about Condor Ferries Schedules. I would like to ask why the Commodore Clipper & Commodore Goodwill seem to be able to operate a more rigid schedule than Condor Liberation? For example Commodore Clipper departs Portsmouth daily at 0900 but Condor Liberation operates to a very unpredictable schedule, due to tidal constraints. But why? Why does the vessel with the most shallow draft have to accommodate tides more? Secondly, I have an idea as to how Condor could increase capacity without unsocial sailing times, which killed the previous double rotations. Could Condor Liberation Operate Poole>Jersey>Poole>Guernsey>Poole? Let Commodore Clipper and Condor Rapide deal with interisland traffic, plus with the new interisland service due to start would make both Islands accessible by both rotations. Arrow moved to the Ro-Ro Berth normally used by Barfleur today. Isn't that Ro-Ro 3? Hi All, Just a quick post to ask what berth Arrow is now on in Poole? She had been at anchor in Poole Anchorage and returned to Port today, but is now no longer berthed on New Quay. Could someone please tell me which berth she in on in Poole? Name or number. She will remain laid up in Poole until required by the Steam Packet. In the meantime, she is on standby for Condor who have had a few problems lately with their whole fleet. Thank you. She is only in Portsmouth having some maintenance carried out. She will leave in the next couple of days. The Steam Packet Co Freight Vessel MV Arrow has today returned to Portsmouth Port. I would just like to ask if someone with more knowledge of Portsmouth Port can please tell me which berth she is currently on? Name or number would be very helpful? Thanks. I thought the main reason for the current timetable, a freight only evening service from Portsmouth to Channel Islands, was because that was the busiest for freight? Therefore, Commodore Goodwill is better suited to that schedule. If Hammerodde had been purchased to take over that schedule, then the additional vehicle deck would have been well utilised, allowing all freight to travel but still accommodating private vehicles. As for the length increase, it's a 5 Metre increase and make her marginally longer than Commodore Clipper. If a draught of 5.6 Metres is too much, then maybe it's time the Channel Islands started looking at improving port infrastructure. They are as much to blame for the limited service options available. I don't think they would. Yes, the Ben has fewer cabins, but her maximum sailing time is 4 Hours 45 Mins, usually only once per week. She also only operates one true overnight sailing, therefore more cabins would be a waste of space. As far as the interior is concerned, the Ben-my-Chree is much smarter than the dull, tired and worn Condor 'decor' onboard Commodore Clipper. When was the last time the Commodore Clipper even had an internal refurbishment? Except, she wont. 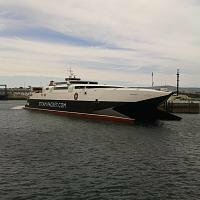 Ben-My-Chree will be retained as a TT, Winter and Back Up Vessel, and will not be leaving the fleet. Arrow will probably become available though. Fingers crossed. She's hardly a looker herself.